Learning Breakthrough - helps with ADD, ADHD, Learning disabilities, developmental issues and Brain Injuries increase attention, focus, attention, impulse control, memory, conceptual reasoning, visual and auditory processing, reading and cognition. Learning Breakthrough Program exercises refine and sharpen the ability of the brain to process information efficiently and maintain cognitive performance that gradually weakens as we grow older. 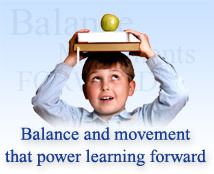 The power of the program comes from improvements it makes in the balance and sensory integration processes. Balance and cognitive decline are two of the most important challenges that naturally accompany aging. One of the main reasons people over the age of 60 visit a doctor is because of a balance related issue. In the case of mental and physiological sharpness as we age, there is mounting evidence that supports the wisdom of the cliche "use it or lose it"! Current research has confirmed that our brains maintain "plasticity" as we age, meaning that neural network development does not remain fixed and that, in fact, you can teach "old dogs" new tricks. If you could do something for as little as 15 minutes, twice each day, to reduce or delay or the onset of balance and cognitive decline, would you? Even more enticing to older clients is the idea that you are never too old to increase the brain's processing power and the real prospect of improving the quality of life even as you mature beyond the family-raising years. The powerful Learning Breakthrough Program™ has been used for decades by developmental optometrists, among others, to treat stroke victims and patients recovering from traumatic brain injuries. The brain changing aspects of the simple and fun program activities will improve your balance, dexterity, motor skills, coordination, memory, comprehension and other cognitive functioning. Consider the Learning Breakthrough Program™ as "brain fitness" or "brain weight lifting" which is exactly what it is. There are many things experts say we can do to improve the quality of our daily living as we age. Genetics, environmental influences and other "unknowns" all have an impact as to how we age. If you keep your brain processing as strong as possible, you improve your chances of having a better quality of life as time goes on. So many injuries occur as we age that are a direct result of falls and other balance related difficulties. On the surface, the Learning Breakthrough Program™ is balance remediation training program which will improve your balance or vestibular sense. The other program activities combined with the balance challenge that is integral to the program improves the way the brain processes information. This can lead to better cognitive functioning which tends to decline as we age. Keep up with physical conditioning like aerobic, walking, strengthening and stretching. Add balance and sensory integration stimulation with the Learning Breakthrough Program™ and you will have enhanced your chances of aging gracefully and productively. To read more about basic brain fitness, click here. To read how the program works, click here.